It’s been a busy few of months at the Kernel growing space over the summer as we have been laying down the groundwork for this brand new project. We have just finished the design for the community vegetable garden and urban farm. We are now waiting for the farmer to finish off the last of the cultivation and then we can begin marking up the site. The site is looking good and the drainage seems much improved as expected! Can’t wait to get started marking it up and cultivating the beds. We are also compiling a wish list of vegetables to grow both in the field and in the double polytunnel. Great news is Gilmartin of Cupar has donated the tunnel for free and all we have to do take it down transport it and put it up on site. Looking at the list of winter crops it’s amazing what can be done. More about that later. The recent winds have brought down a lot of our apples please feel free to come and get some. In addition to creating a productive space at the Kernel, we would also like to help everyone grow food at home. So this week we are launching our first Growing at Home workshop series. 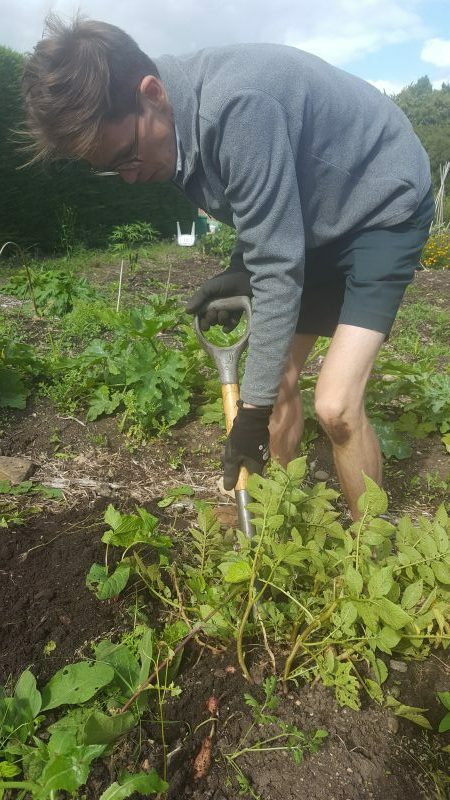 Over the next 11 weeks we will offer an introductory course for beginner’s where everyone can learn the fundamentals of vegetable growing, suitable for a small-scale garden plot. The course is free and all are welcome to join. To book a place please get in touch with Elliott at eforsyth@standrewsbotanic.org or call 01334 476 452.